High Pines Dexters is located in the southwest corner of South Dakota (about 60 miles south of Mt. Rushmore). This part of SD is considered semi-arid and it takes several acres to run a cow calf pair. After more that 2 years of reseach, we decided that Dexters were the right fit for this area. They do not require as much feed and do well in our weather that ranges from over 100 in the summer to -30 (F) in the winter. Our breeding program is based on maintaining the dual purpose nature of the breed. We believe in out-crossing our cows with non-related bulls, but do reserve the right to selectively line breed if necessary to improve certain traits in our animals. We do not want to breed larger Dexters, one of the desirable traits of these animals is their size. They are easier to handle and as we get older, this is a consideration. Also, we must supplement feed in the winter months and it costs less to feed a 750 pound cow than a 1500 pound cow. Our beef market is generally couples, they have a hard time consuming a half of a commercial market steer. A hanging half of Dexter is about 225 pounds, yielding about 190 pounds of "right sized" portions that can be consumed before the meat gets old. We endeavor to keep the milking trait strong in all of our animals, Udder conformation, udder suspension, teat placement, and teat size are all factors in whether an animal will be breeding stock or steak. Peggy makes several types of Dexter milk soap that feel great on the skin. We prefer animals that have good depth in the rib and have a straight top and bottom line. We breed and select for these traits. We do believe in promoting good health in our cattle and we have a great working relationship with our Veterinarian. Because we do show our cattle, we have an "open" herd (one that is exposed to other cattle). As such, we do vaccinate our cattle according to current guidelines to prevent either the giving or receiving of unwanted health problems. We also believe in genetically testing our cattle. Chondrodysplasia and PHA (see 'Dexter cattle' page) are realities in Dexter cattle, but are easily managed. 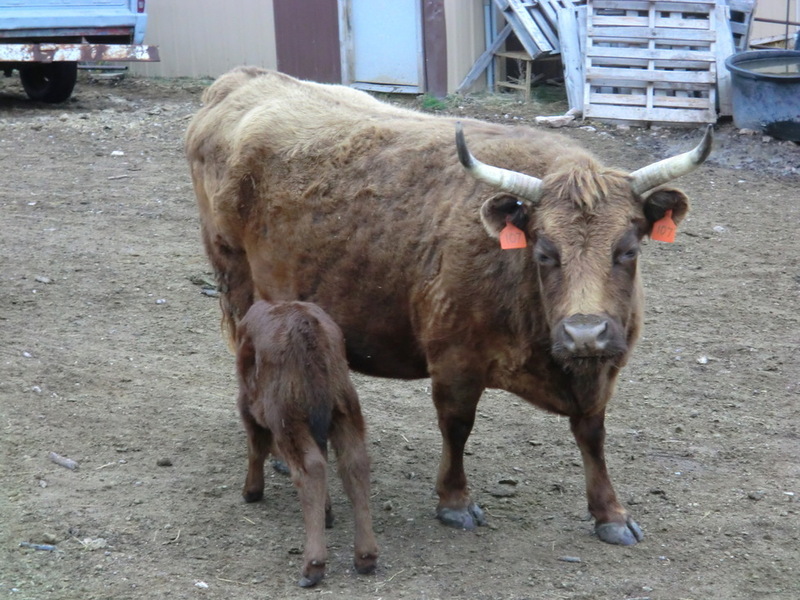 High Pines Dexters' has elected to only raise and breed cattle that are free of both of these traits. Most importantly, we do not believe that every heifer should become a breeding cow and we do not believe that every bullock should be a herd sire. By aggressive culling and selective buying for the above mentioned traits, we strive to improve the meat, milk, and structural traits of Dexters, while maintaining the moderate size and docile personality that set the Dexter breed apart. Hannah's Iris Lacey, our herd matriarch. Now deceased, but her genetics run strong in our herd.